Handcrafted at Kaserei Oberli in St. Gallen, Switzerland, at about 2,000 feet above sea level, Üsi Minnie is the creation of master cheesemaker Christian Oberli and made in the style of Alpine Mutschli. 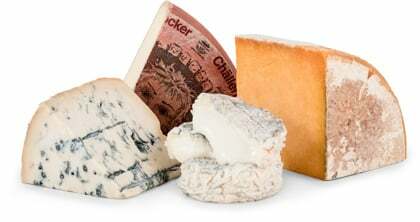 Mutschli cheeses are made in higher altitude alpine dairies, typically from curds leftover from Gruyere or Bergkase. Fun fact about this cheese’s name: “Üsi” translates to “our” and is typically only used with great affection. Minnie is none other than one of Christian’s favorite cows on the farm where the cheese is produced. Kaserei Oberli was founded in 1918 and was largely focused on the production of Emmentaler, most of which was exported. After the family’s second generation took over, Oberli began producing Tilsiter and did so exclusively until 1998 when Christian diversified further into the production of Raclette, Sennenkase and, of course, Üsi Minnie, the cheese you will have the opportunity to try this month. Üsi Minnie presents a rich, dense, creamy paste. 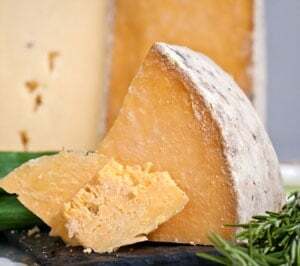 It’s not hard to conjure images of the field that Minnie grazed in to produce this bold and flavorful cheese as it evokes deep roasted nutty and buttery flavors, balanced nicely with big floral, herbal and grassy notes. A touch of lactic bite and spice on the finish round it out nicely. Overall, a really unique and flavorful Alpine cheese. We’d pair it with sweet, crisp, white wines like Piesporter and Riesling, or with hard ciders. A crisp Gewürztraminer would do the trick, as well.